The actor: The role John C. McGinley ended up playing on Scrubs for nine seasons semi-famously called for a “John C. McGinley type.” Yet, in a surreal turn of events, McGinley had to audition for the role multiple times despite being the world’s foremost John C. McGinley type: a badass character actor with a warped comic sensibility that makes him perfect for comedies. McGinley began his career as a theater actor before making the leap to the big screen with the help of Oliver Stone, who cast him in such iconic, zeitgeist-capturing smashes as 1986’s Platoon and 1987’s Wall Street. He’s been ubiquitous in television and film over the past few decades, often playing law-enforcement agents and other authority figures in films like 1991’s Point Break and 1995’s Seven, before finding a career-defining role as the irreverent but loving doctor/mentor he played on Scrubs for close to a decade. Baseball buff McGinley can currently be seen (and heard) stealing scenes from the likes of Harrison Ford in the Jackie Robinson biopic 42, as colorful announcer Red Barber, whose poetic, flavorful commentary on Robinson breaking the race barrier is a definite highlight. 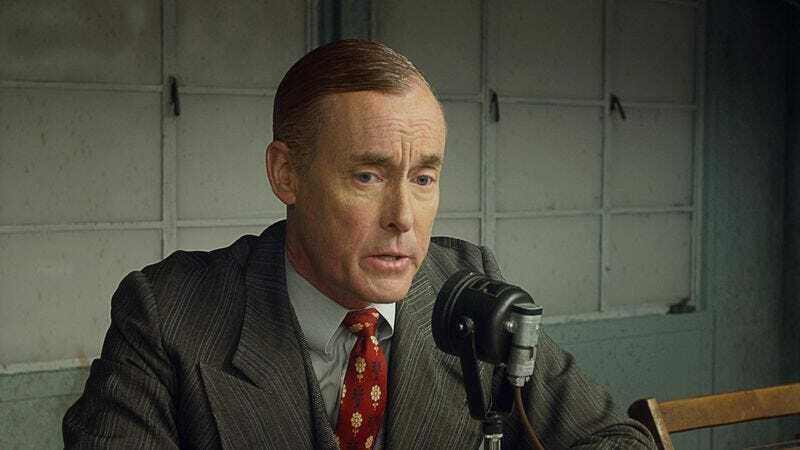 John C. McGinley: 42 was directed by a guy named Brian Helgeland. And Brian lives literally across the street from me in Los Angeles. And for some reason, I couldn’t get any traction going in to audition for the role through the normal channels. Agents, blah blah. And so I finally called and said, “Listen, I’d like to jump the chain of command here and go over and ring his doorbell and say, ‘Hey, I’d like to do this film with you.’” And so I did. And Brian was immediately positive and not at all taken aback that I would come and ring his doorbell, since we’ve had many conversations walking up and down the street. He gave me a bunch of disks of Red [Barber] and Mel Allen doing broadcasts of World Series throughout the ’50s and into the ’60s. He said, “Listen to these. Then, when you’re comfortable, I’ll come over and you can do the voice for me. I can’t cast you unless I hear you do the voice.” And I was comfortable with that. So for a week or so, I just obsessed on these discs. And when I felt comfortable enough to read his script with Red’s voice, I called him and said, “Come on over.” I was very nervous. He came over, and I did it for him. It was very Big Boy. It was without parasites, without pilot fish. He said, “Okay, that sounds good. You’ll be Red.” And that was that. The A.V. Club: What was it about the part that appealed to you so much? Are you a big baseball fan? JCM: I’m a baseball fanatic. I bleed Yankee blue. I wanted to be in the film, and where I saw myself in the film was as Red Barber. I wish I could be one of the players, but that ship sailed. I knew of Red, having been a baseball fan and a broadcast historian, and so that’s where I saw myself fitting in the story. I knew Jackie [Robinson’s] story pretty well, not as well as I would subsequently learn. AVC: Did you watch the Jackie Robinson biography that Robinson himself starred in? JCM: Nope. Just as a history buff and more of his stats. Then I would come to learn what a civil-rights pioneer he was as well. Peripherally, I knew all that stuff, but not as I would come to learn doing homework on the movie. AVC: The Red Barber voice is very distinctive and infectious. Did you ever find yourself slipping into it at home? JCM: No. I had it in the car, and I would do his broadcast back and forth with him. Not stuff that was in the film. Plus, Brian also gave me license to go through Red’s autobiography and all these World Series broadcasts and cherry-pick things out and present it to him. The guy won an Academy Award for writing L.A. Confidential, so telling an actor, “You can bring some of Red’s stuff—no John McGinley stuff—Red’s stuff, to my script…” Which I did, and he would end up choosing stuff that was germane to the story he was telling. And that was thrilling. All actors want to do is feel like they’re collaborating on something. As soon as you give an actor a chance to collaborate, we want to run through a wall for you. Don’t get me wrong, there are plenty of sets where you hit your mark, say your line, and you’re wrapped. And that’s fine. That’s not a big deal. But when you do bring actors in, like Oliver [Stone] does, like Kathryn Bigelow does, and Roland Joffe and these great directors. When you start to bring actors in on a collaborative capacity, they’ll do anything for you. AVC: It’s striking how lyrical and poetic some of Barber’s lines in the film are. It’s almost like he’s spontaneously composing poetry about the things in front of him. AVC: He’s not just describing the game. He’s also interpreting it for people who aren’t there. JCM: There was no way to consume Dodgers games other than through Red Barber, unless you were there. And Ebbets Field was tiny, so not many of you were at the game. The vast majority of people who wanted to hear or be part of a Brooklyn Dodgers game could either read it in one of the seven dailies tomorrow morning, or they could listen to Red. That’s it. It’s not 2013. There was only one way to get that game. JCM: On Platoon I was offered in 1984 a very tiny part that Ivan Kane would go on to play. Then the financing fell out, and the film was scuttled for two years. Cut to 1986, I was doing Hamlet with Kevin Kline at the New York Shakespeare Festival, playing third guy on the right and understudying Laertes, which was a big deal. So we were at the Laertes sword fight at the end of the play, and Oliver [Stone] calls and says, “John Spencer dropped out of playing Sgt. O’Neill, but we’re doing Platoon again. Do you want to play the fourth lead?” And I very much wanted to, but not at the risk of burning a bridge with Joe Papp, who was in charge of the New York Shakespeare Festival. No one in their right mind in New York would burn that bridge. You were lucky enough to get into the fraternity/sorority of the Public, which is what it’s called. You would never, ever do anything to jeopardize that. And I didn’t. I called Oliver and said, “I would love to be in the movie. I have to go and ask Mr. Papp if I can go.” So I did. I took a meeting with Mr. Papp, lowly third guy on the right in Hamlet, and he said the most wonderful thing and was true to his word. He was way back in here, and there was a perpetual cigar in his mouth and he says, [imitates Papp’s gravelly voice] “Mack, we’re going to do it again.” I said, “What?” And he said, “We’re going to do the play again. Go to the Philippines, come back, and tell Oliver I said hello.” And I said, “Okay, great.” I left, and I called Oliver and said I’m in. Then we were postponed for seven months. Because there was a revolution. AVC: Apocalypse Now was similarly afflicted with problems stemming from coups and revolts in the Philippines. JCM: Yes. [Ferdinand] Marcos had lost the free election and then wouldn’t leave. So that’s when Reagan gave him political asylum in Hawaii. And that’s when Imelda [Marcos’] shoes became the fodder of late-night jokes. So we were sitting in the village. Hamlet opened and closed, and it was the most important Hamlet on these shores. Life went by, and finally the revolution settled down and we left to go and do Platoon. We flew into Manila; we had two days at the hotel, and there were kids—little boys and teenagers—walking around with AK-47s, throughout the city. Then we immediately went out to a place that was in the middle of nowhere; it was a triple-canopy jungle. “Triple-canopy” meaning the level of forestation left you on the ground in almost perpetual darkness; that’s how thick the vegetation was. And we went through about 17 days of a boot camp where we weren’t allowed to call anyone by their names, but by their characters’. Then at the end of the 17 days, we started shooting. Guys weren’t acting; they were behaving. And that’s what Oliver wanted. Everybody was miserable, and that’s what he wanted. Then, because he shot it as close to chronologically as possible, as you died—as your character died—you left. So three and a half months into it, there’s about four or five of us who aren’t dead, and it got very strange. Because everyone else is gone. We started with three groups of eight, 24 guys, and then five are left. Again, it took the burden off the actor, actor-schmactor. You didn’t have to generate much stuff. You had to get in front of the lens and behave. AVC: Coppola famously said of Apocalypse Now that it wasn’t a film about Vietnam: It was Vietnam. It seems like the making of Platoon was a similar experience. JCM: That’s certainly what it felt like. Of course, toward the end, for the last month or so, every single day there was a rumor that Cory Aquino—the president who came in after Marcos—had lost the army. And if she had lost the army, then there would be a coup. And every day the rumors became more and more pronounced. It becomes very chilling when you’re there. Surely the actors could take the leap to [comparing it to] Vietnam, about how fragile their situation was in the Philippines, And it was just… actors weren’t acting. AVC: It seems like there was a genuine element of danger. JCM: Yeah. Somebody died. Some kid got buried alive. Another kid got bit by a bamboo viper, which is called a five-step snake. In other words, in the five walking steps it takes for your blood to circulate, the bamboo viper’s poison will make its way from wherever the entry is to your heart, then it will arrest your heart. This little kid died. So all these things are swirling, and then somebody calls “action.” The lens loves all that. AVC: Considering what a perilous experience the making of the film was, it must have been tremendously validating for it to become not just a success but also a pop-culture phenomenon. JCM: Yeah. The Academy Awards used to be on the same night as the NCAA championships, and [that year] Syracuse played Indiana. Since I went to Syracuse, I didn’t go out to the Academy Awards. I chose to stay to home with a bunch of other broke New York actors, because Orion wasn’t willing to pay for our flights. So we stayed at home, and we flicked back and forth between the Syracuse game and Oliver, for the four awards the film would win. So was it validating? Sure. But not enough to want to miss the Syracuse game. JCM: I was doing Talk Radio down at the Public—so Joe Papp did hire me again—with Eric Bogosian. And Oliver called and said that he was doing this film about greed and the world of finance and did I want to be in it. And I said yes, but I didn’t have the spine to go in and tell Mr. Papp that I had to pull out of another production. So we had it that I had to be wrapped by 7:00 so that I could be doing Talk Radio every night at equity half hour, 7:30. I was only on that film for about two and a half weeks, but it was really intense. All that stuff on the trading floor. And my father, like Oliver’s father, worked downtown in a financial capacity. So it was great. Charlie [Sheen] and I got to hang out with guys at Bear Sterns, which no longer exists, for a couple weeks. It was kind of the actor’s dream to be in a studio film during the day and in a hit play at night. British actors, they get to do that in London sometimes. But it was the New York working actor’s dream to be able to do both those things. AVC: Did Stone’s approach change at all between the two films? JCM: Same. The great thing about working with Oliver—and this is where people get in trouble sometimes—is that his sets are his. They’re not ours. And he puts creative blinders on that are tantamount to what a Kentucky Derby thoroughbred has on as far as his vision goes. If you can fit within the context of that creative vision, it’s nirvana. If you want to operate outside of it, [that] is when all the crazy stories of actors getting run over by Oliver happen. But it’s Oliver’s movie. And same with Kathryn and with Roland and with Brian, on 42. That’s Brian’s film. JCM: James Cameron had seen Platoon and Wall Street, and he was the producer of [Point Break], and for some reason I got cast in that role. When we were in the Philippines, Willem [Dafoe] had been offered the role of Johnny Utah. Charlie [Sheen] had been offered it, and I think Johnny Depp had been offered it. So that script had been kicking around for a while. It was called Johnny Utah. Then we got back and Keanu [Reeves] was cast in it, and they offered me the boss of the FBI. I’ve subsequently done more of them, but that walk-and-talk where all that expository information is done at the beginning of the film and that crazy walk-and-talk through the cavernous office space of the FBI—that was the hardest thing I’d done. Scrubs, we used to do it once a week, but at that time it was just really hard. And that felt good. What’s so interesting about Point Break to me is that it’s a study of testosterone and adrenaline by a woman. That’s why it’s little more interesting than it should be. AVC: That seems to be true of a lot of her films. JM: She finally has a female protagonist in Zero Dark Thirty. [Bigelow’s Blue Steel also features a female protagonist in Jamie Lee Curtis —Ed.] But for Kathryn to be doing a study of those two chemicals in men, I thought, made it unique. And Patrick [Swayze] was so physically gifted. He was so great as Bodhi. JCM: I have mixed feelings about Car 54, Where Are You? Because we shot it as a musical and whoever the studio head was at Orion, or whoever the powers that be were, cut all but, like, two musical numbers out of it. That is the same as cutting the musical numbers out of The Wizard Of Oz; it wouldn’t be that interesting. So the film, to me, doesn’t make sense without the musical numbers in it. They kept in one of Buster [Poindexter’s] musical numbers. And then maybe there’s one other, but the film doesn’t make sense. I wouldn’t pretend to know what happened, what the decision-making process was, but we busted our humps on those numbers, and then the film came out and I didn’t understand what I was watching. AVC: The film is interesting as well in that it was an adaptation of an old television show. Now that’s ubiquitous, but back then it was relatively rare. JCM: The other fun part of that is that, because Orion was also producing a film in Kansas City called Article 99, I was doing them simultaneously. I would do Car 54, Where Are You? Monday through Wednesday, and they’d fly me last flight out from Toronto to Kansas City to shoot Thursday and Friday in Kansas City. And that happened for about four weeks. I love grinding like that. Everybody says that to you, and it never happens. What we’re going to invent when you get there on the day is that the 10k light just went out, and that’s what we’re going to address, not the Bobs doing the interviews. But he was true to his word, and I was only down there for three days, which is fantastic because we just stayed in. I’m only in two or three different interiors, that interview room and out in the office and then at the stapler guy’s desk. That’s it. So for three days, we just immersed into that and shot tons and tons of stuff for those people coming in when we’re going to fire them or downsize. We just started to roll camera and do stuff. AVC: Was it tricky nailing the tone of the film? It has a very distinct tone. JCM: Yeah, Mike was pretty good about communicating the parameters that he wanted to operate in. And then, given that, he put some slack in the leash and we were good to go. JCM: Seven was produced by Arnold Kopelson who also produced Platoon. He called me up at home, which is very unusual, and said, “You should come down and meet a director named David Fincher for this film we’re going to do.” As written, the head of the SWAT team was a person of color. And Arnold just said, “You should meet David. I’m not going to do any more than that.” I met David, and we immediately vibed. He said, “Well, great, you can play California, head of the SWAT team.” Then I got hooked up with LAPD, and Brad [Pitt] and I got to spend a bunch of time with them at the police academy and stuff, fire weapons and go on ride-alongs. Then we got to shoot it. We were in a building, where we go to find the skinny guy, we were in a building that was filled with asbestos, and we shut down for a little while and then we came back after the asbestos problem had been dealt with. So I was on the film a lot longer than I was on the page. We shot a ton of helicopter stuff for the end of the movie. I don’t think anybody knew that film was going to turn out the way it did, except for David. Whenever I’m surfing around on TV and I see Seven, I stop. Not to see myself play California, but just, the film is so stunning. We shot about three or four different endings about what’s in the box. I remember it because I was up in the helicopter in Lancaster, California, which is north of Los Angeles, and there were three or four different endings that David had written. He kept the one where Gwyneth’s head is in the box. AVC: Fincher is notorious for being meticulous in his vision and very hard on actors. Did you find that to be true? JCM: Yeah, but he’s also great with the actors. He’s very protective of the actors, and he’s demanding on his crews, but all the department heads are guys who have worked with him through music videos, commercials, and four or five different films. While he may have been demanding on them, his loyalty is reciprocated by them going from film to film with him. And by the results. AVC: It’s a good script. It doesn’t exactly need to be punched up. JCM: I’m only encouraged to fix things when they don’t exist. Office Space. The Bobs. AVC: You create something out of nothing. JCM: Yes. It’s very liberating when you don’t have to do that. The burden of pulling a rabbit out of a hat is a very slippery slope. So I went in to meet Albert to play his brother, and he goes, “But you’re not Jewish.” And I said, “No, but so what?” And he goes, “No.” So I get to do that delicious scene in the beginning of the movie and worked with one of my heroes. That was a dream come true. JCM: I got the pilot for Scrubs sent to me, and in the margin for Dr. Cox, it said “a John McGinley type.” So when I went in to audition, I said to Billy Lawrence, who’s a dear friend of mine, I said, “Well, I’m John McGinley.” And he said, “I know, but because there’s so many ladles in the soup in television, you have to go through an audition process.” Disney was the producer, so I had to audition twice at Disney. And NBC was the exhibitor, and so I auditioned twice at NBC. So I auditioned for “a John McGinley type” five times. AVC: Were you confident, considering you are arguably the foremost John McGinley-type actor in the world? JCM: Yeah. So, then the show took off. They put us on behind Friends, toward the end of Friends’ run. Then they put us on behind Frasier. So we always had this great lead-in. Then we were on our own, and somehow we stuck around for nine years, which is impossible. AVC: It seemed like you were on the verge of death for at least four or five of those. JCM: We were. Season eight, we shot a series finale, not a season finale. Then we got brought back for season nine. That was right at the apex of the recession. And all of the sudden, a phone call comes and is like, “We’re going to shoot 14 or 15 more episodes of Scrubs. So you want to do it?” It was like manna from heaven. I’m going to do another one with Billy Lawrence starting Friday, so we’ll see. Fingers crossed.